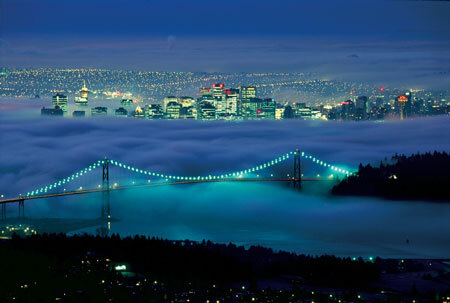 While visiting Canada, be sure to allow time for an introduction to Vancouver, a coastal gem in British Columbia. Known for its gorgeous scenery combined with a diverse downtown heart of restaurants, museums and business districts, it also boasts the most agreeable climate in Canada. All of these things make this coastal city popular with tourists each year, and the city welcomed an impressive array of international visitors during the 2010 Winter Olympics. Although the largest city in British Columba, it manages to hold on to its rustic charm and natural beauty nonetheless. Visitors will enjoy bike riding, shopping, touring a local museum or just relaxing in a spacious park. Home to many upscale hotels, you will find this charming city perfect for a family vacation or romantic getaway. Book a room at the Sheraton Vancouver Wall Centre, which regularly features regular money-saving offers and is just around the block from popular sites including Stanley Park and the Vancouver Art Gallery. Or, go on an adventure by taking a private seaplane transfer to Vancouver Island where you can stay at the Clayoquot Wilderness Resort. The resort features temperature-controlled tents that allow visitors the opportunity to take in much of British Columbia’s stunning natural playground. When you’re out and about in the city, there are many restaurants to try, and your culinary experience can become a high point of your vacation. The Blue Water Café, for example, offers the largest selection of oysters in British Columbia. Frequented by celebrities, this is a good spot to celebrate an anniversary or take your loved one on a romantic evening out for no special reason at all! RainCity Grill has a reputation of being one of the best restaurants on the city’s west End, and your meal will be accompanied by views of Stanley Park and English Bay. Your palette will welcome their variety of organic vegetables, cheeses and salmon that is fished personally for the restaurant’s guests. For something a bit less formal, check out BBQues, featuring chicken and ribs that you’ll crave long after your meal is through. For a bit of cultural diversity, enjoy a delicious and interesting meal in the largest Chinatown in Canada. With all this said, an proper introduction would not be complete with just restaurants and lodging alone. Are you a summer sports enthusiast visiting in the winter? You’ll be pleased to know there are nine indoor pools that are open year round and include early morning to late evening time slots. Anyone can enjoy a dip in one of these facilities, and they are located all throughout the city for easy access. For travelers with a true sense of adventure, check out the Capilano Suspension Bridge, which has been in the business of thrilling adventurers since 1889. 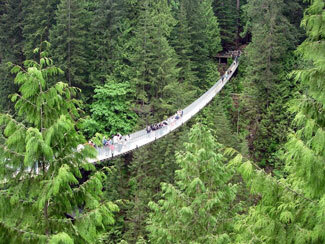 Walk the elevated bridge series that stretch up to 100 feet beyond the forest floor below. Children will enjoy Maplewood Farm with 200 animal and bird species to enjoy. Other natural experience for children include the VanDusen Botanical Garden and the Vancouver Aquarium. This city is a vacation in and of itself, even if you never venture beyond the city’s borders. It’s true that once you have an introduction to the city's diversity and beauty, you may never want to leave.